‘The Time Meddler’ is arguably one of the most important serials in the long history of Doctor Who, ushering in the so-called pseudo-historical genre while also introducing the Meddling Monk and a direct link of sorts to the then-shrouded past of the Doctor. 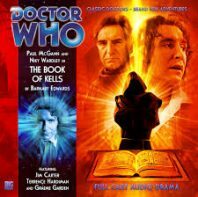 ‘The Book of Kells’ updates the stylings of that famous tale for the audio adventures of the Eighth Doctor, creating one of the more enjoyable entries in the series in the process as disembodied voices, mysterious disappearances, and death haunt the Abbey of Kells in Ireland in the year 1006. The past two stories have suggested that there is a Time Lord mysteriously interfering with events, and a look at the setup and setting of ‘The Book of Kells’ perhaps makes it unsurprising- though nonetheless exciting- that the Monk is the culpable figure. His plan here to use the true medieval events surrounding the strange disappearance of the titular Liber Columbae in order to craft a new circuit for his TARDIS is a natural scheme for the character, and Graeme Garden is superb as this new incarnation of the classic foe who retains a more casual and roguish charm and humour beneath his exterior that no other foe quite manages. It takes a little bit of time for the revelation to occur despite the rather direct homage to the Monk’s first appearance and a little bit longer yet for the Doctor to realize it, but the scenes featuring both Time Lords are easily among the strongest this fourth series has yet offered. This is also the first story to really give Tamsin Drew meaningful development as she is directly involved with the Doctor and vital to progressing the overall plot by herself as she goes after the mysterious Brother Lucianus and eventually fools the Monk into materializing with a fake page that she switched out earlier. She’s enthusiastically brave and reckless, a combination that Niky Wardley brings out effortlessly and one that will certainly continue to test the Doctor as the two continue to confront dangerous situations. Already Paul McGann and Wardley share an easy chemistry that promises to carry these future adventures as their characters continue to develop and understand the nuances of each other. Of course, even bigger than the appearance of the Monk is the re-appearance of former companion Lucie Miller in the guise of Brother Lucianus. While the name and the accent in retrospect suggest that this twist is coming, the production team does a wonderful job keeping it secret until a dramatic post-credits scene. This puts the companion competition from ‘Situation Vacant’ in an entirely new light and certainly opens up plenty of dramatic potential going forward as the Doctor and Lucie seem to be set on a collision course once more. As an entire production, then, Barnaby Edwards’s ‘The Book Of Kells’ is a strong blending of past and present that weaves the history of a lesser-known document into proceedings flawlessly. While not the deepest or most thought-provoking story, its performances, direction, and sound design are all top-notch, and the humour and drama on display culminate with a clear and exciting trajectory for the remainder of the series to take.